Will Senate Dems Condemn Bribery Attempts and Threats Against Sen. Collins? Here’s the news you need to know on this Wednesday, September 12, 2018. 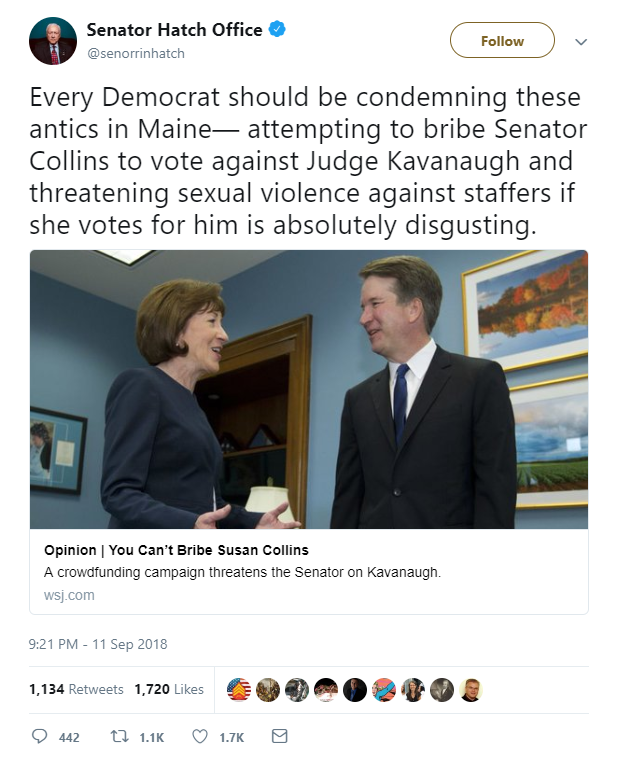 @senorrinhatch: Every Democrat should be condemning these antics in Maine— attempting to bribe Senator Collins to vote against Judge Kavanaugh and threatening sexual violence against staffers if she votes for him is absolutely disgusting. By publicly promising to pay money to someone if a vote goes a certain way, Democrats are running afoul of federal law. The anger Democrats have embraced against the Brett Kavanaugh’s nomination has turned criminal. Democrats in Maine have started a crowd sourcing fund to raise money for a challenger to Susan Collins if she votes for Kavanaugh. The if is important because they are threatening action based on a voting condition. That may very well run afoul of federal law. The frustration has boiled over at points. Annie Clark, a spokeswoman for Ms. Collins, provided The New York Times with copies of a letter and multiple voicemail messages addressed to the senator using vulgar language and outright threats. One caller told a 25-year-old female staff member at one of Ms. Collins’s Maine offices that he hoped she would be raped and impregnated.